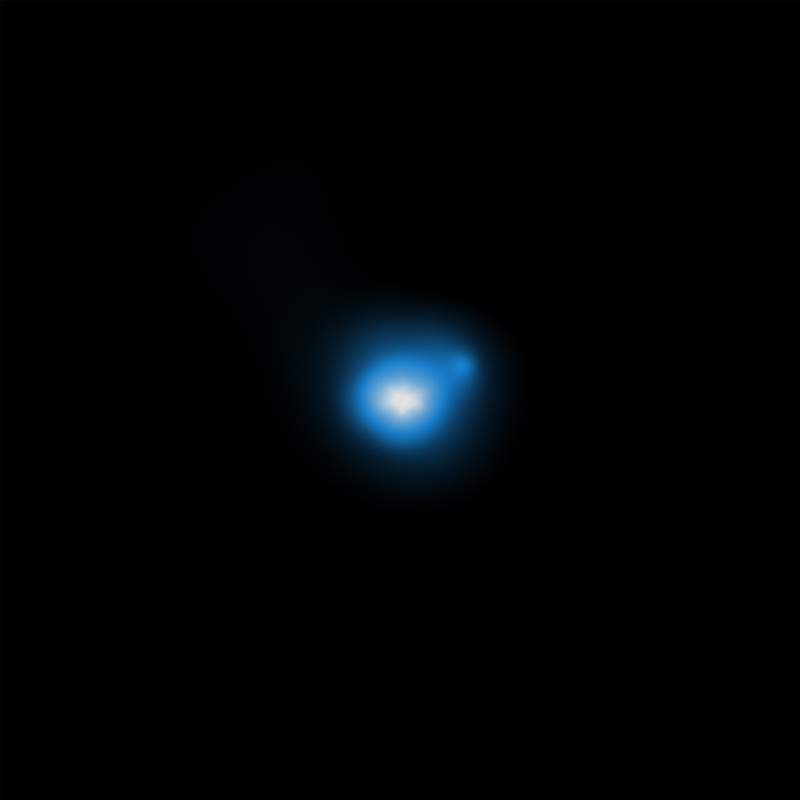 The farthest jet yet in X-ray light - at a distance of about 12.4 billion light years -- has been discovered. Material rapidly falling onto a giant black hole in center of a galaxy produces the jet. The jet is at least 230,000 light years long, or about twice the diameter of the entire Milky Way. This composite image contains X-ray (blue), radio (purple), and optical data (yellow). This composite image shows the most distant X-ray jet ever observed. X-ray data from NASA's Chandra X-ray Observatory are shown in blue, radio data from the NSF's Very Large Array are shown in purple and optical data from NASA's Hubble Space Telescope are shown in yellow. The jet was produced by a quasar named GB 1428+4217, or GB 1428 for short, and is located 12.4 billion light years from Earth. 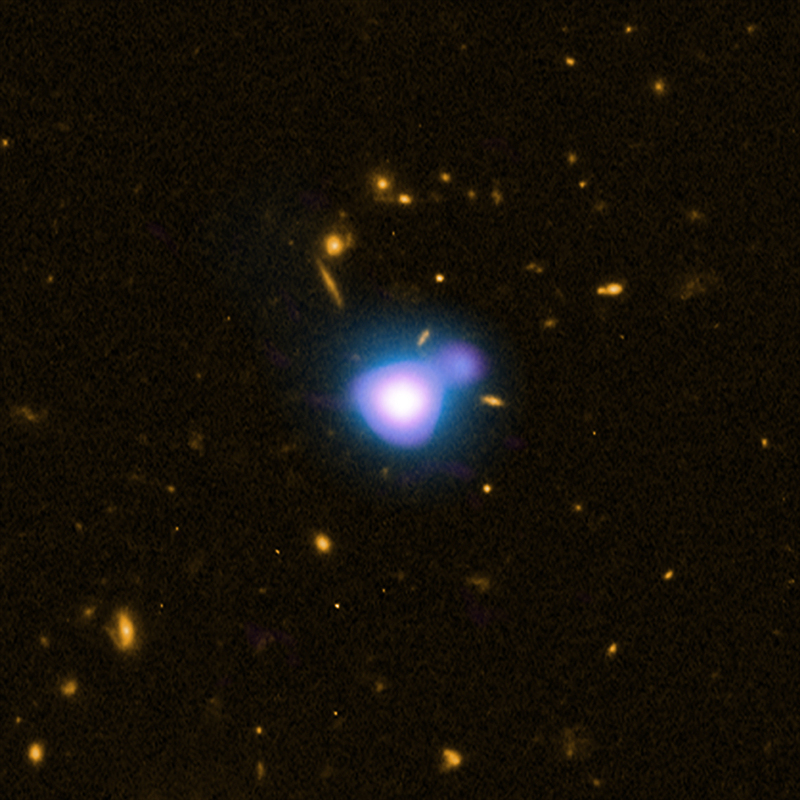 Labels for the quasar and jet can be seen by mousing over the image. The shape of the jet is very similar in the X-ray and radio data. Giant black holes at the centers of galaxies can pull in matter at a rapid rate producing the quasar phenomenon. The energy released as particles fall toward the black hole generates intense radiation and powerful beams of high-energy particles that blast away from the black hole at nearly the speed of light. These particle beams can interact with magnetic fields or ambient photons to produce jets of radiation. As the electrons in the jet fly away from the quasar, they move through a sea of background photons left behind after the Big Bang. When a fast-moving electron collides with one of these so-called cosmic microwave background photons, it can boost the photon's energy into the X-ray band. Because the quasar is seen when the universe is at an age of about 1.3 billion years, less than 10% of its current value, the cosmic background radiation is a thousand times more intense than it is now. This makes the jet much brighter, and compensates in part for the dimming due to distance. While there is another possible source of X-rays for the jet - radiation from electrons spiraling around magnetic field lines in the jet - the authors favor the idea that the cosmic background radiation is being boosted because the jet is so bright. This result appeared in the September 1st, 2012 issue of The Astrophysical Journal Letters. Coordinates (J2000) RA 14h 30m 23.70s | Dec +42° 04´ 36.50"
Black holes could produce dark matter? A most distant X-ray jet ever observed. About 12.4 billion light years from Earth. Combining data from Chandra, Hubble and the NSF's Very Large Array. X-rays are blue, optical yellow and radio purple. In the constellation Boötes visible in the Northern Hemisphere.